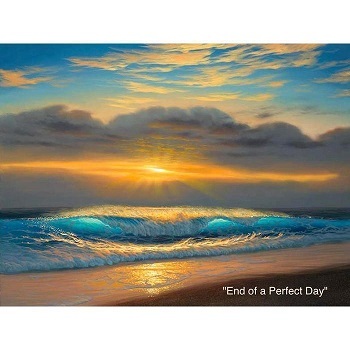 "End of A Perfect Day" celebrates the feeling of accomplishment and reward. This painting is loosely based off of Sunset Beach on the North shore of Oahu. The light filtering through the waves just before cresting is a signature component of Walfrido's work. Never miss another glorious sunset again. Voucher will be mailed to you. Must have gift card before picking up purchase! With over 34 years of painting experience, Walfrido is considered to be one of the most distinguished seascape artists today. Working along-side father and renowned artist Edgardo F. Garcia and Bill Wyland, founder of Wyland Galleries Hawaii, Walfrido learned to play upon the quality of light – whether it is a romantic moonlight or a brilliant sunset. In addition to these traditional seascapes, Walfrido’s more modern trailblazing series includes a Koa Wood merchandise collection, Disney characters collaboration and Princess Cruise Lines edition. Artist retains all rights to artwork. Image may not be reproduced or used in any form.